Special Olympics cheerleaders have been practicing for six weeks to perform at the Idaho State Cheer Competition. 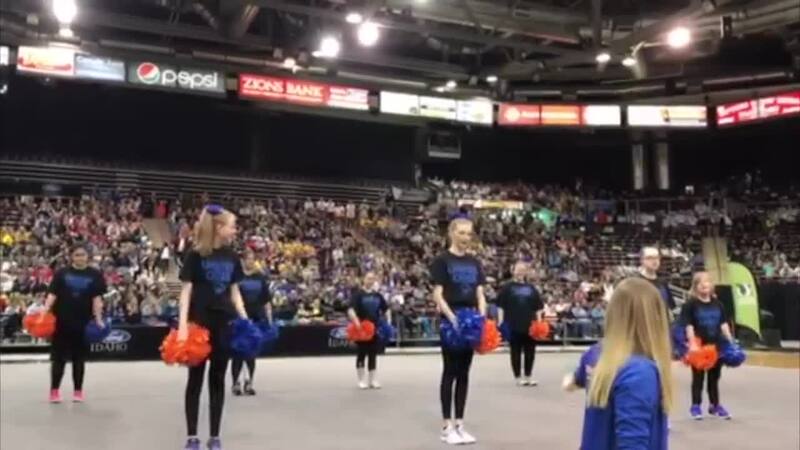 NAMPA — Cheerleaders from all over the Gem State competed at the Idaho State Cheer Competition at The Ford Idaho Center in Nampa. Cheerleaders from Special Olympics Idaho performed a routine that they've been working on for six weeks. “I pretty much do the same things as everyone else does,” said Lea Iannacone, Special Olympics Cheerleader. The athletes practiced with cheerleaders from Boise State. “I am a baser, you know, I go with the leg and stuff,” said Iannacone. “The best part is seeing how excited they get and knowing that maybe they don’t always have these same opportunities. It’s super rewarding to be able to see them express themselves in this and get to experience it like every other kid does,” said Emily Covolo, Boise State Cheerleader. The performance included a dance, cheer, and stunts. “When this opportunity came up and it was the Special Olympics and she loves dancing and it’s almost impossible to find a dance class or anything like that for her,” said Beatriz Castro, Maria Catro's mother. It's a rewarding experience for everyone involved. “We have always been supportive of the Special Olympics and having her be a part of it was just fantastic," said Ed Castro, Maria Castro's grandpa. “We do it because it brings us as much joy as it brings the girls who come to this, it’s really fun. It’s one of our favorite parts of the whole week. It’s to come and work with them and to get to see how much passion they have for dance and cheer and to see them put it out on the floor at the very end for the final product is really really rewarding,” said Kayla Daughters, Boise State Cheerleader.